I am working on an exciting project. 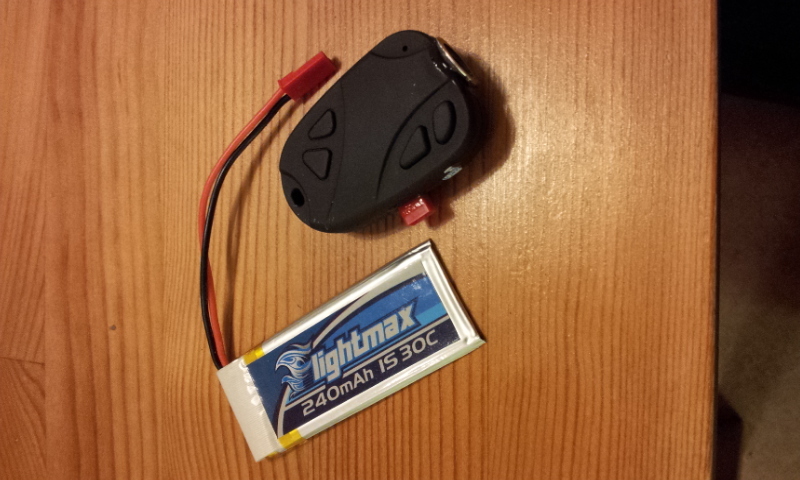 I am converting my Turnigy 9X radio to FrSky. In my other post I wrote about what parts were needed to do the conversion. Now I am trying to give a short summary of how I managed with the actual work. 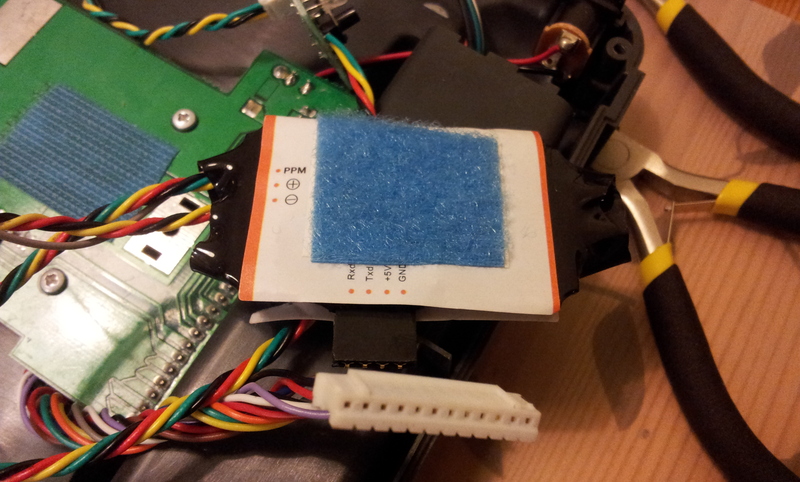 As it turned out the DIY kit of FrSky is somewhat different of the one that RC Model Review tutorial uses. He used the old module, that was available by that time he made his review. 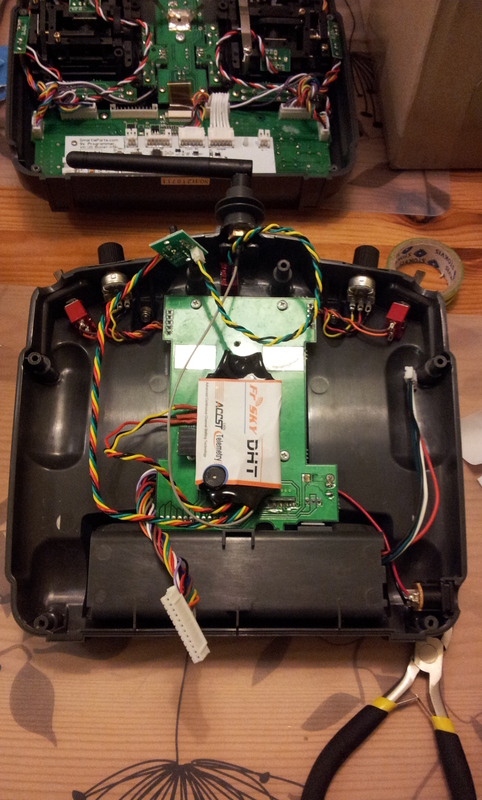 The new kit has a switch for telemetry mode and firmware update. I had to find some space for that switch. 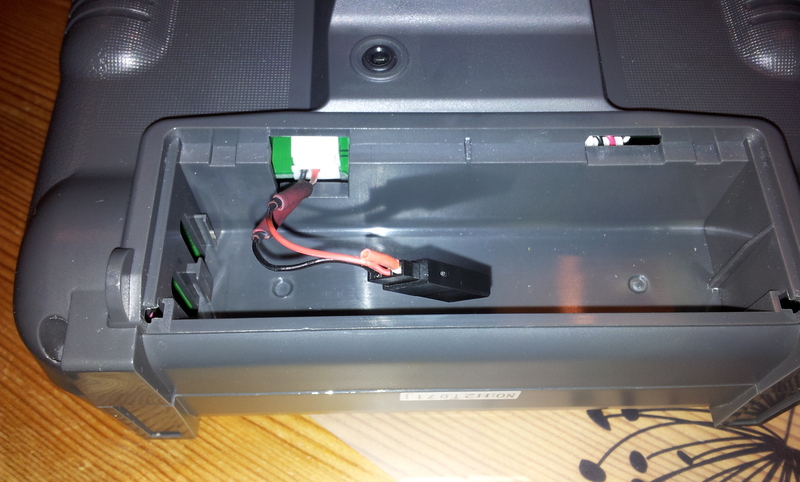 I drilled a hole on the back of radio under the metal support. 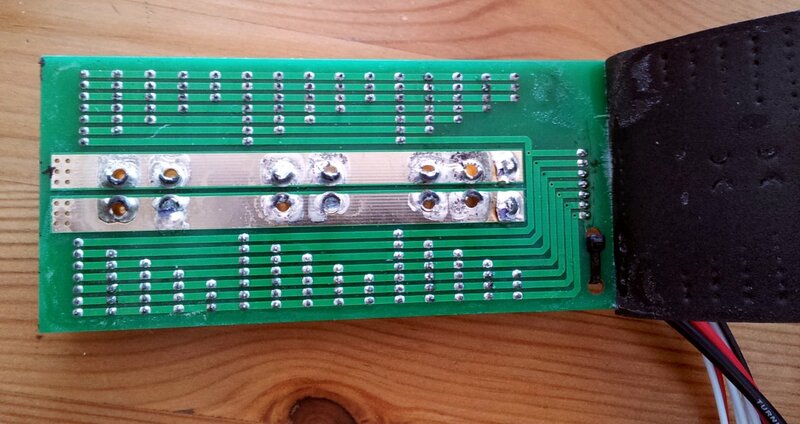 I faced some complication when I wanted to use my epoxy glue to fix the small circuit board with the bind switch and status light. The epoxy got wrong it the bottle, I had to discard it. Placed an order on new epoxy from local hobby shop but it will arrive only in a couple of days. 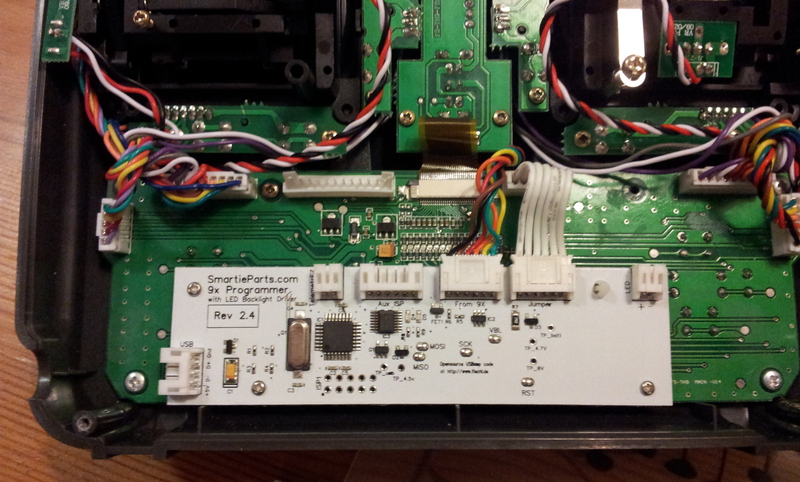 I followed the instructions when I installed the small programming board from Smartieparts. Rather easy to do. 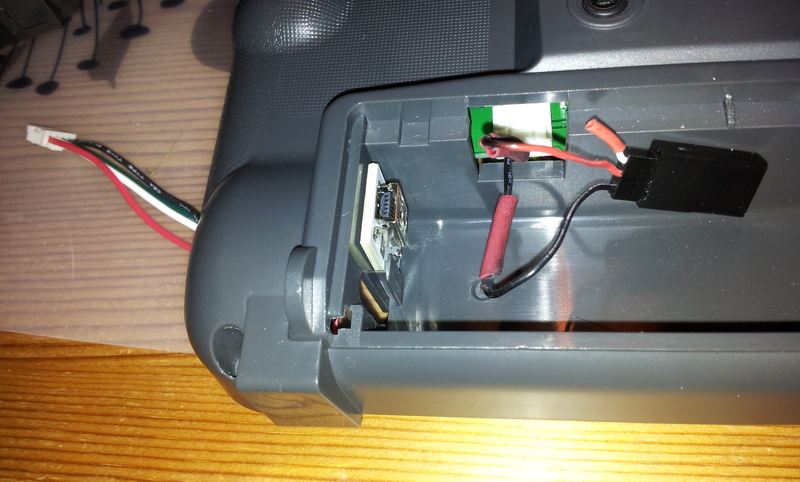 The small board that has USB connection has perfect fit in the radio back, in the battery compartment. Just slides into a cavity without glitch. 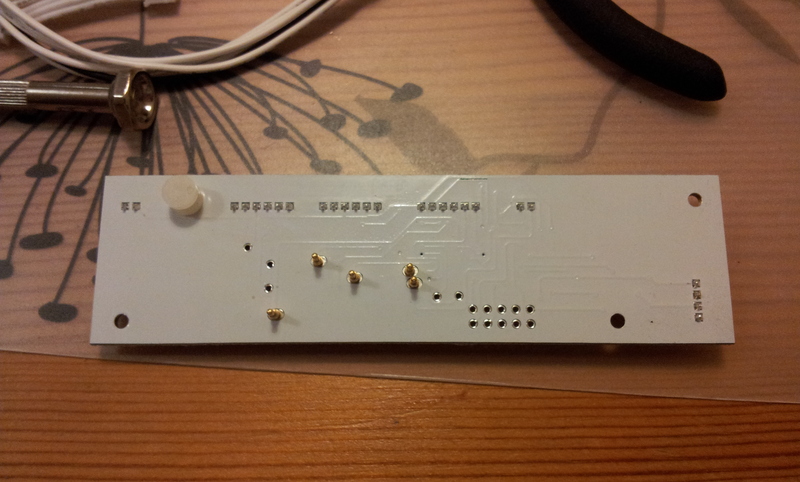 This board enables even backlighting of screen, I haven’t ordered that though. So far I haven’t felt the need for lit screen. 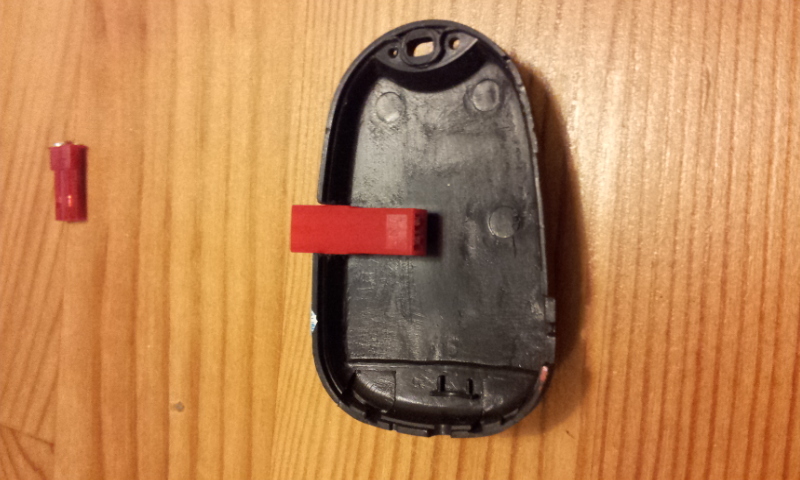 Another important part was the battery upgrade. 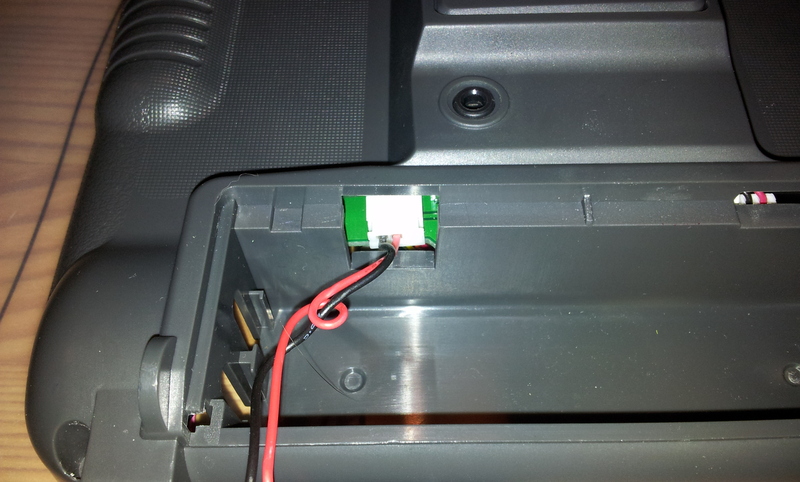 I left the original connector in the radio and cut the wire to the AA-battery compartment. 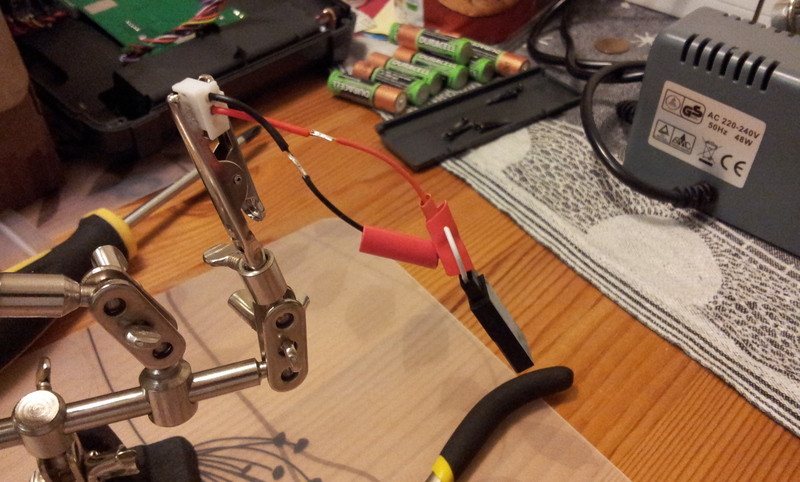 Then I soldered on a servo connector to be able to use the matching connector on the Li-Fe battery pack. I not only double-checked but triple-checked the polarity. Did not want to perform inverse polarity failure. I had the most trouble with the radio antenna. 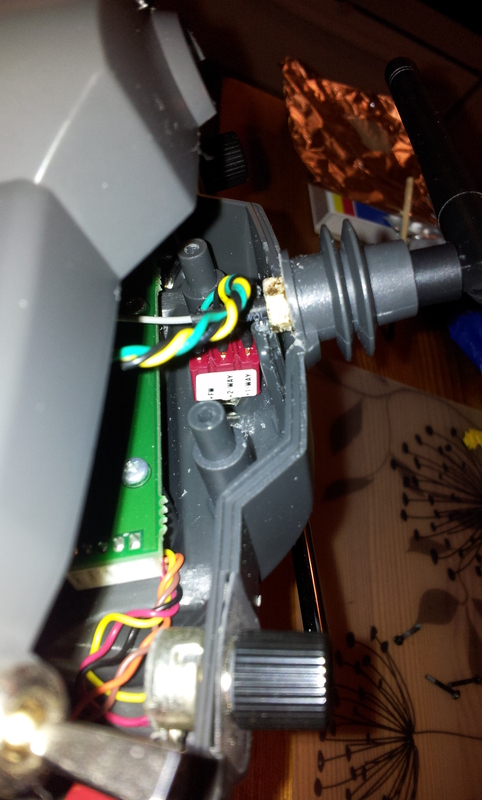 In the original review from RC Model Reviews that old FrSky module does not have a small washer on the antenna sleeve. The new one has. It is there for having a better mechanical connection. 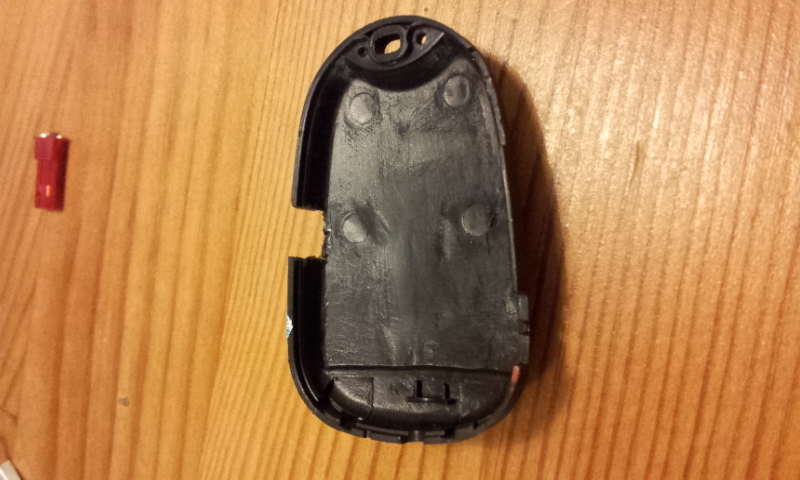 However it was more difficult to push through the plastic feature of my radio. I think the reason is that my radio was already modified once by its previous owner, so some of it parts were already altered. It should work most probably fine on a brand new unit. After some gentle violence I managed to get the antenna in place. 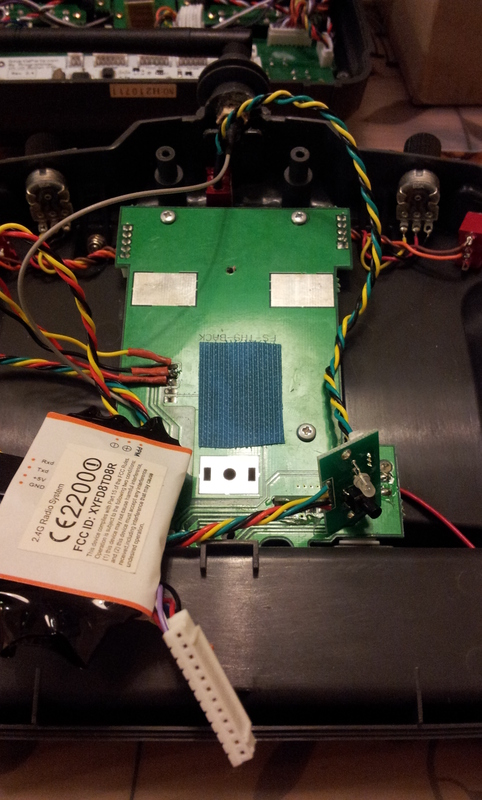 When I made the holes on the top of the radio to be able to get access to binding switch and status light I did not use any template. I just drilled one hole, put the small unit there and marked the next hole by eyeballing it. Then drilled it. And it went all right. I did not use a battery drilling machine, I only have a big machine, so was rather careful not to drill too deep into the radio. Went OK. I received my glue so I can finalize the position of binding switch. I need to do the most tricky part of the build, the actual soldering of the DIY kit connections. When that is ready I can proceed as RC Model Reviews shows in his tutorial and build together the radio. Module in the middle to not block metal contacts. Bind switch spacer glued into housing. When all the building part is ready on the transmitter I need to refresh the software to er9X firmware as well. That will be a major leap for the radio software interface. Then I also need to change the radio receiver to FrSky on my Easystar plane. A lot of work is left actually. I have two keyfob cameras from Hobbycity, the old SD resolution ones. Their code is #7, the worst of the lot actually. #3 was far better. These cameras have a built-in battery, that is a 1-cell Li-Po with 140 mAh capacity. You charge it from USB-port. As far as I know traditional USB ports supply maximum 500 mA current. So this would charge up in roughly 17 minutes. I am very unsure how good the battery charging circuitry is in the unit. I would assume not so good. The premature death of my battery underlined this thought. I was reluctant to just dispose the unit. It costs 15 USD, so quite cheap. But why dispose something if there is a chance of mending it. So I tried. 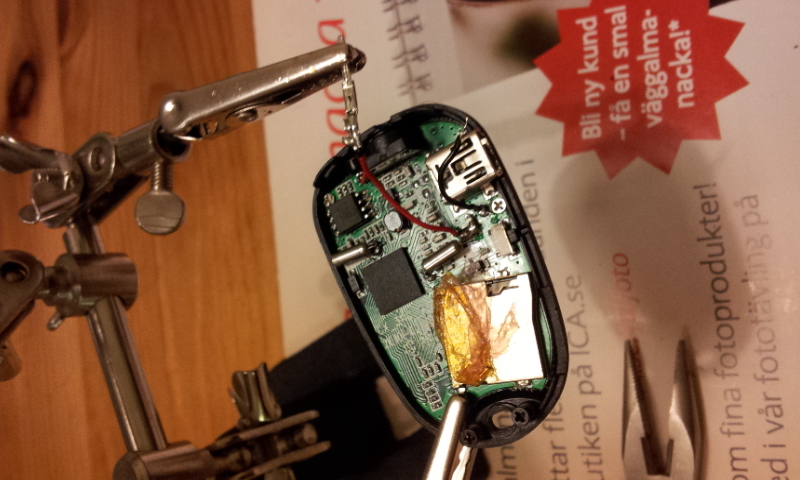 I tried to solder the contacts onto the wires. 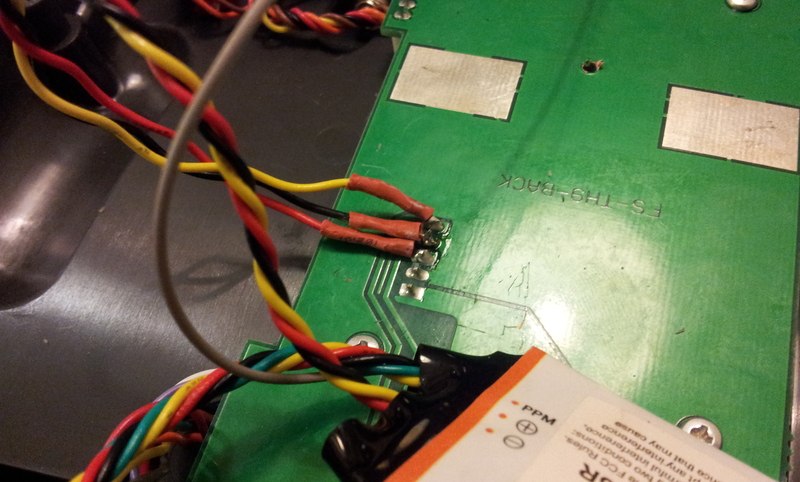 These wires are very thin, so use a fine grade soldering iron. Mine is very coarse, had to be very cautious. When you have soldered the wire onto the metal pin you have to push together the last portion that forms an open U-shape. Otherwise it will not enter the plastic connector housing. Then I had to remove some material from the other half of the housing. To have a good support for the connector I removed a rectangular area. I double checked the polarity to be sure. Then I could assemble it and glue in the connector. 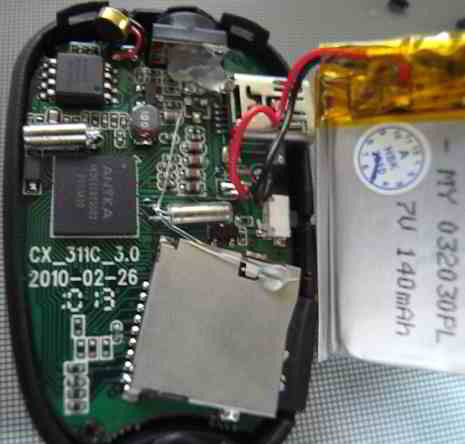 It will be subject to some force when connecting and removing the outside battery. I used CA glue. Just a size comparison, the new battery next to the camera unit. 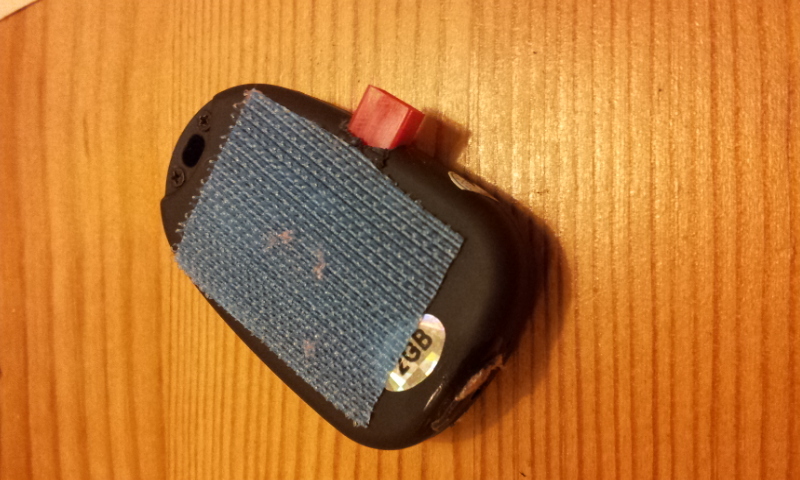 I will use adhesive velcro to fix it on top. Maybe I will have the battery on the plane and the camera will sit on the battery. This way I will get better (less) drag coefficient. Important in flight. I will need to do this on my other camera, that has reduced battery life. Probably will throw in the towel soon. Since this new battery is 240 mAh (vs 140 for the original) I will get significantly better battery life. And I can monitor the cell voltage with my Cell Voltage Monitor device. Important factor in keeping batteries healthy. I just received my parallel charging board from Hobbycity. They were super fast, I expected the package for the end of this week, it arrived on Monday. Great service! According to reviews it can happen that polarity is wrong on the connectors. 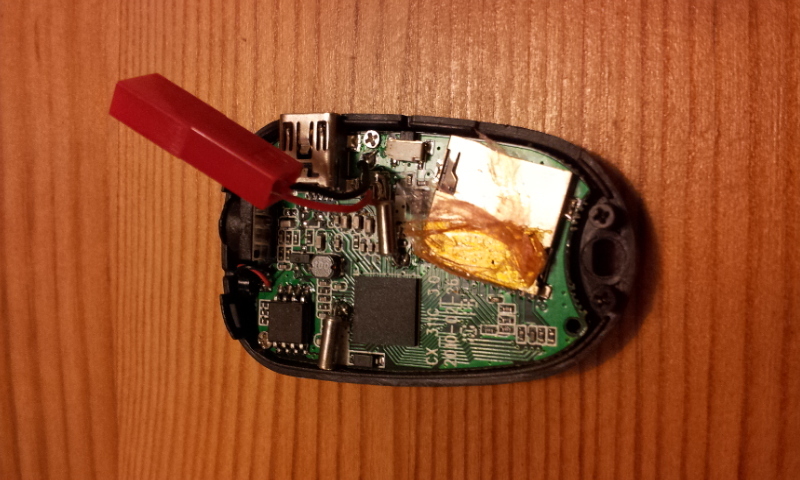 This causes risk of permanent failure on the batteries that you connect to it. So it is a good idea to check connections and polarities prior to using this board. Mine looks like following after removing the isolation from the back. I think that this looks okay. 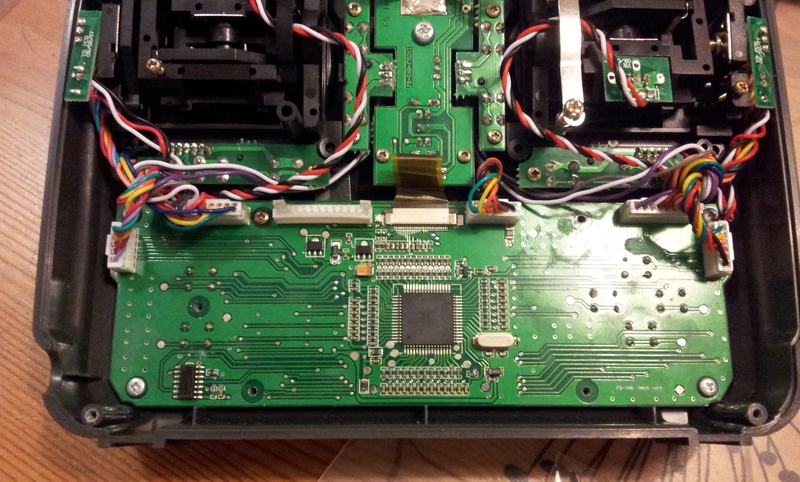 The red wire is connected to the plus side of the main XT60 connector. 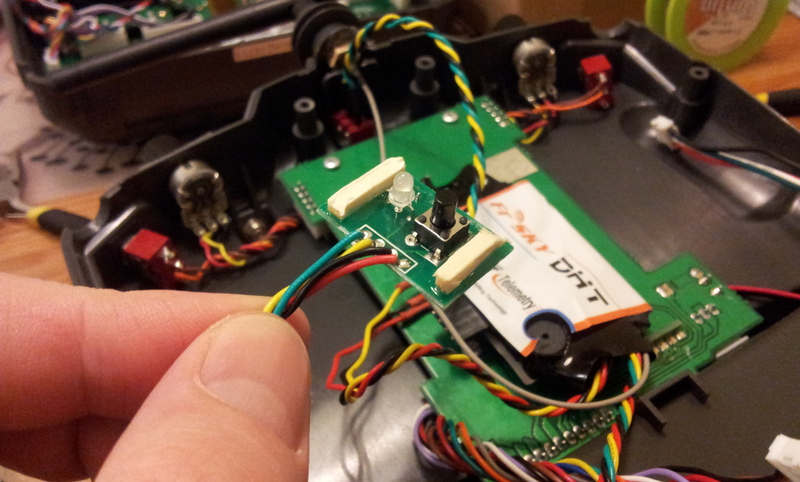 And all the charging XT60 connectors are on the same side, the side to which the red wire is soldered. I checked if the balancing port ground wire is connected to the matching side of the balancing connectors. It looks like so. I just double check this one more time and then will do a big charging of 6 batteries at once. Since I received my 3 new Zippy 3S 2200 mAh 20C batteries I can use 6 packs. 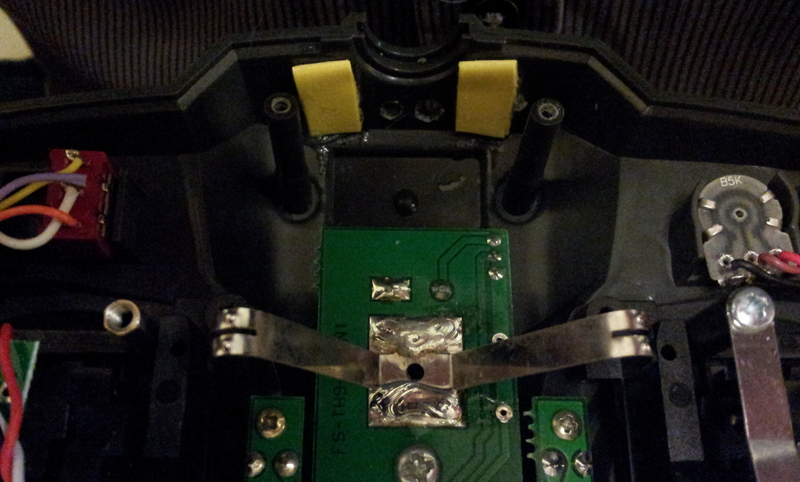 I just made sure that they are all okay, checked the voltages. One came with 2.2V on one cell, this I corrected to 3.8V with the storage charge option on the iCharger unit. Later I will try to make a short resume of how you can do such a parallel charge and what do you need to look at to be on the safe side. I will update this very post to give you more details. Stay tuned. 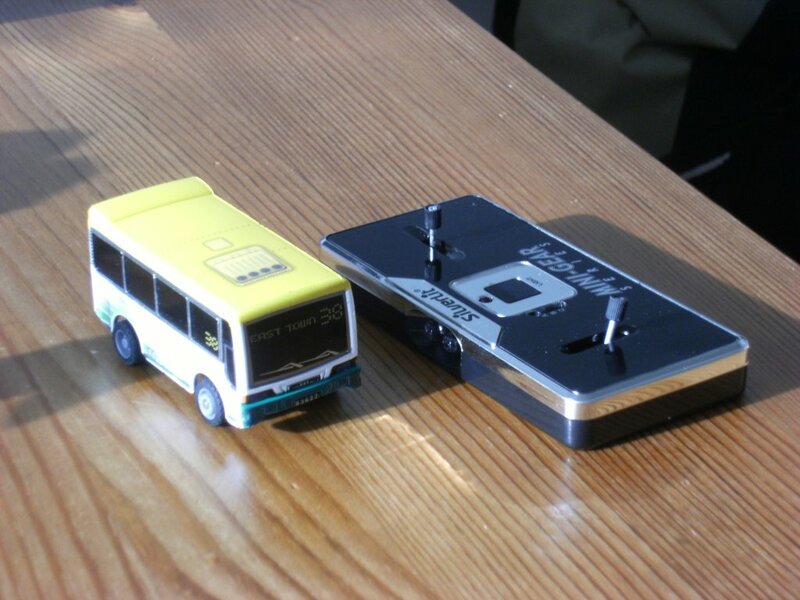 The bus is powered by an AAA-size battery. You can use rechargeable ones if you have such. 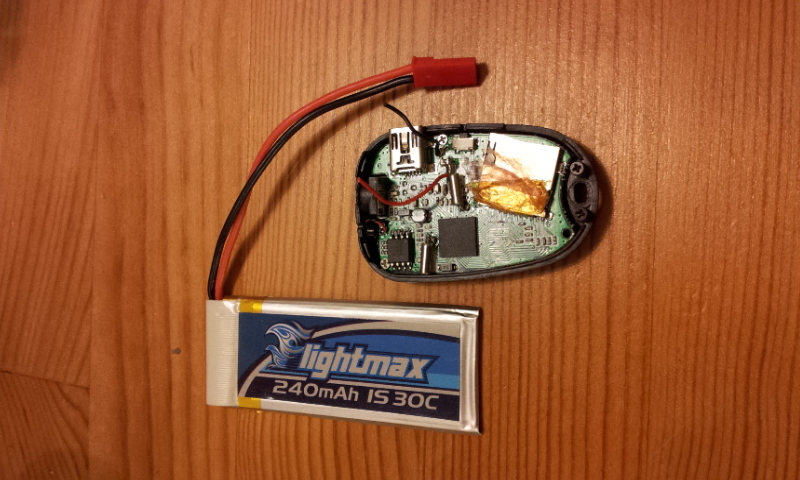 The transmitter is powered by 2 pieces of such batteries. Signal is transferred by IR (infra) light. Since you will not use this model from great distances it is no problem. There is a highlight that I need to talk about: you can switch on headlights. What a detail! I am not fully experienced with the controls but will practice more. Update 2011-05-14, a bit more control. And offline FPV with on-board recording from the bus! Thank you for the nice time, I wish you all the best!